I've launched a crowdfunding campaign to help get more equipment for a bigger and better ham radio demo at OSCAL (19-20 May, Tirana). Please donate if you would like to see this go ahead. Just EUR 250 would help buy a nice AGM battery - if 25 people donate EUR 10 each, we can buy one of those. 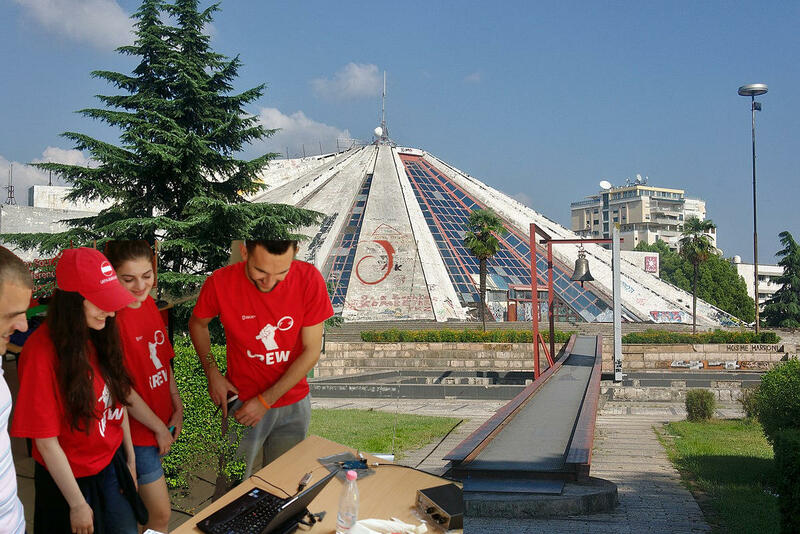 You can help turn the pyramid of Albania's former communist dictator into a ham radio station for OSCAL 2018 on 19-20 May 2018. This will be a prominent demonstration of ham radio in the city center of Tirana, Albania. Under the rule of Enver Hoxha, Albanians were isolated from the outside world and used secret antennas to receive banned television transmissions from Italy. Now we have the opportunity to run a ham station and communicate with the whole world from the very pyramid where Hoxha intended to be buried after his death. Donations will help buy ham and SDR equipment for communities in Albania and Kosovo and assist hams from neighbouring countries to visit the conference. We would like to purchase deep-cycle batteries, 3-stage chargers, 50 ohm coaxial cable, QSL cards, PowerPole connectors, RTL-SDR dongles, up-convertors (Ham-it-up), baluns, egg insulators and portable masts for mounting antennas at OSCAL and future events. The station is co-ordinated by Daniel Pocock VK3TQR from the Debian Project's ham radio team. Donations of equipment and volunteers are also very welcome. Please contact Daniel directly if you would like to participate. Any donations in excess of requirements will be transferred to one or more of the hackerspaces, radio clubs and non-profit organizations supporting education and leadership opportunities for young people in the Balkans. Any equipment purchased will also remain in the region for community use. Please click here to donate if you would like to help this project go ahead. Without your contribution we are not sure that we will have essential items like the deep-cycle batteries we need to run ham radio transmitters.